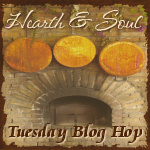 A warm welcome to The Hearth and Soul Blog Hop, the blog hop for recipes using healthy ingredients, family and comfort food recipes, articles about healthy living, real /slow/ local/sustainable food, foraging, herbal remedies, organics and gardening. My husband and I returned home from Israel last Thursday evening. I so enjoyed exploring Tel Aviv and Jaffa and I can’t wait to share my adventures with you! We were entertaining friends this week and I revisited some recipes I have been making for years. Boeuf Bourguignon and Easy No Bake Lime Cheesecake were two of the dishes on the menu. Today I’m featuring wholesome home-baked treats that would be perfect for teatime. Love lime cheesecake! Looking forward to trying that. Thanks for hosting. I have my Teatime every day, it is a special time in the afternoon. I would really enjoy any of your Teatime treats with my tea. I am sharing my Sweet and Sour Chicken with Fried Rice to bring in the year of the Horse for the Chinese New Year. Thank you so much for a great party! So wonderful your traveling to Israel. I brought my steamed mussels to the party.. not really teatime food but I nice light dinner. All those treat you posted sound so scrumptious! Thank you for hosting! It is such a pleasure to participate in the Hearth and Soul Hop!